Would you enjoy your Arizona home more if you had an outdoor kitchen? How about entertaining, would that be easier and more fun as well? The truth is that most people love using the outdoor portion of their home, but are not always sure how to use it. This can be remedied by adding an outdoor kitchen to the property. It gives you the chance to have somewhere to sit and chat, plus a beautiful new focal point to your home. 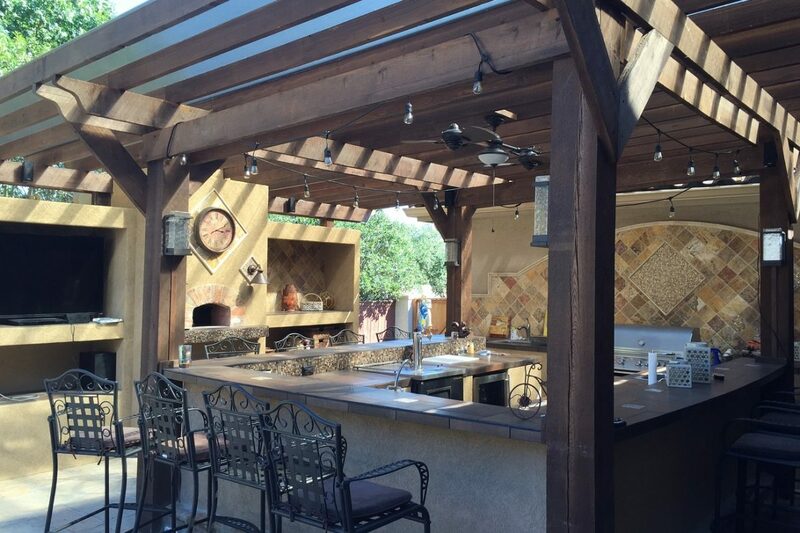 Here are some benefits of adding an outdoor kitchen to your Arizona home. One of the best reasons to add an outdoor kitchen to your Arizona home is to enjoy the outdoors. That is likely one of the biggest reasons you purchased the home you did anyway. You can go out, cook an amazing meal, and enjoy eating it while watching the sunset. Cleanup is easier outdoors, as crumbs won’t be left on your kitchen floor. Plus, you don’t have to worry about heating up your home while cooking your favorite meals! Having a kitchen that is an extension of your home, just outside, gives you a lot of freedom. The best way to extend your current indoor kitchen to the outdoors is by using the same materials. Things like granite countertops and heavy-duty appliances can be used in both indoor and outdoor kitchen environments. They simply need a little extra protection from the weather and other outside factors. Aside from the fact that a kitchen added out back will not increase your utility bills because it won’t heat up your house, there are other benefits your Arizona home gets from an outdoor kitchen, too. By adding this feature to your home, you increase its value. Think about how nice it would be to sell your home down the line and get nearly everything back that you put into the renovation. This renovation gives you a great return on investment. Plus, you got to use the outdoor kitchen you had installed for the years up to the sale! For help with designing the perfect outdoor kitchen for your Arizona home, contact the experts here at Luxury Remodels Company ™. We would love to help you create the kitchen of your dreams, whether inside or outside of your home.